How to finance an Acquisition? Acquisitions in today’s fast-paced and challenging business environment can provide companies with the critical mass necessary to compete effectively. A merger or acquisition can be called a pivotal event in a company’s evolution. Acquisition Financing is the means of providing capital to acquire a company. Acquisition Capital mostly involves a package of different layers of growth capital, including stock purchase / exchange, bank debt, mezzanine funding, and private equity. Debt, equity, and hybrid financing can be used to fund an acquisition. 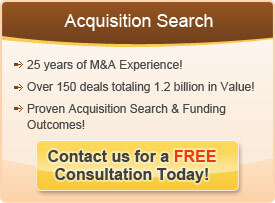 Acquisition Financing focuses on identifying the optimal financing solution for a company. This happens when the company’s cash flow based value and growth potential is linked to the cost and flexibility of the financing structure. Acquisitions can also be financed through internal cash accruals, which is the first asset used by most profit making companies to finance the acquisition. Companies also take loans from banks or even raise capital through an IPO (Initial Public Offering) or an FPO (Follow on Public Offer). Valuing an acquisition candidate is like valuing an investment. An experienced M&A advisor can help estimate cash flows and determine an appropriate risk-adjusted discount rate. He or she then computes the net present value (NPV). For example, if firm A is acquiring firm B, synergy exists when the cash flow of the combined firm is greater than the sum of the cash flows of firm A & B individually. M&A experts feel that credit crunch has led to a rise in asset-based lending, seller financing, and alternative sources of growth capital for buyers. Current industry statistics reveal that many acquisitions tend to fail due to their priorities not being in line. Listed below are some key do’s and don’ts to keep in mind when pursuing an acquisition.